The Auxiliary Law Enforcement Response Team (ALERT) program is designed to train volunteers to assist officers of the San Francisco Police Department in the execution of their duties. While primarily focused on preparing its volunteers to assist law enforcement after a disaster, the ALERT program provides a wide spectrum of training to its members. ALERT volunteers frequently assist the SFPD in areas outside the disaster arena. It is open those who live, work, or attend school in San Francisco. Graduates of the San Francisco Police Activities League (P.A.L) Law Enforcement Cadet Academy are also eligible to join. All volunteers must be at least 16 years of age or older. Volunteers will receive training from the San Francisco Police Department and other San Francisco emergency-related departments. The ALERT program will have Basic, Senior, and Supervisory level positions. Based upon the volunteer’s level of additional training, he/she may wish to obtain Team Leader or Senior Team Leader status. The goal of the program is to locate, train, and then coordinate volunteers to safely perform law enforcement related tasks after major disasters and in non-emergency situations. ALERT will function as an adjunct to a law enforcement presence. Such tasks might include: traffic control, foot patrol of business and residential areas, reporting criminal activity, looting and property damage observation, supplying information to the incident Command Post, working in partnership with other civilian volunteer groups to provide well-being checks, assisting with medical aid, assisting with Command Post functions, assisting Animal Care and Control in the handling of pets, securing resource locations, and delivering logistical supplies. In addition, ALERT members will direct individuals to mass casualty and shelter locations, assist at reunification centers, provide support at schools for reunification, and participate in Operation Return. Numerous other non-emergency tasks such as security assistance at street festivals, sports events and concerts as well traffic and pedestrian control for parades and political demonstrations. What is the profile of an ALERT member? Is at least 16 years of age and lives, works, or attends school in San Francisco. Recognizes the need for city-wide involvement in law enforcement tasks and has the time to commit to providing assistance. Wants to be of value and service to the larger community during both times of disaster and non-emergency situations. Has a particular interest in law enforcement, the maintenance of law and order, and who wishes to connect and work with members of the San Francisco Police Department. Can maintain an interest in building community preparedness to respond to and recovery from a major disaster. He or she may possess skills or work experiences which include emergency repairs and construction. Has good communication skills, a balanced approach to stressful situations, and may be willing to take on the role of supporting the Police Department when necessary. Is willing to participate in training and maintenance of skills. As part of their commitment, community members joining ALERT will be required to attend a minimum of one of our four drills per year to maintain their program status and certification. Team Leader and Senior Team Leader status requires additional drill attendances. ALERT members will work closely with Full-Time and/or Reserve Police Officers in the event they are deployed after a disaster. The Basic ALERT volunteer (see below) will have no law enforcement powers other than those available to all citizens. All ALERT members will be provided with uniform apparel and equipment to be worn during training drills and for either emergency or non-emergency deployments. The ALERT volunteer will only need to supply themselves with specified pants and boots. Prior to ALERT training, every volunteer will be subject to a basic background check given to all Police Department volunteers. After completion of training and after having met any and all requirements, the ALERT volunteer will be given identifying credentials reflecting their level of training and role within the ALERT program. NOTE: Allow an ample amount of time for your background check process to be completed prior to the training dates. Continuous training is essential to maintain the skills needed to assist the SFPD with their duties. All active/trained ALERT members are asked to attend as many drill exercises per year as possible. Details will be emailed to active ALERT members prior to the date of the exercise. All ALERT volunteers are required to participate in at least one drill exercise per calendar year to remain eligible for a deployment. 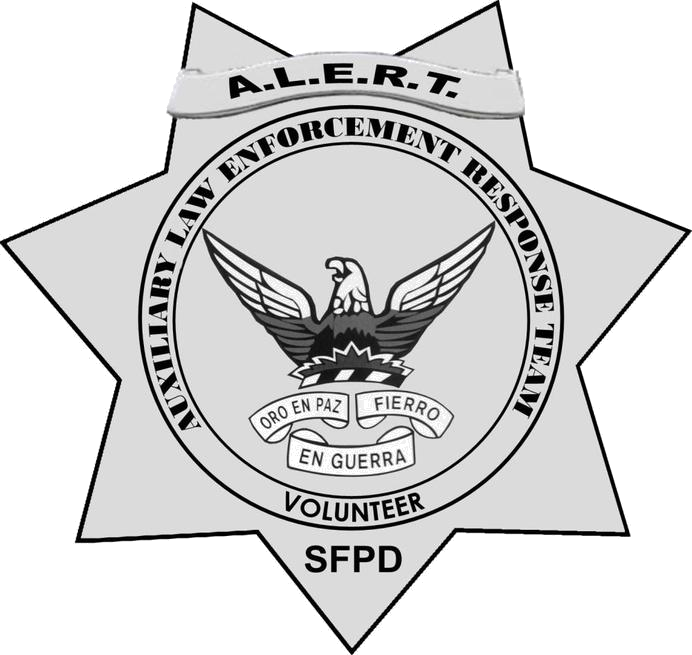 In order to participate at events in support of the ALERT program, such as recruitment activities, and to assist the SFPD with events outside of a disaster/emergency related deployment, ALERT volunteers must sign and submit a waiver form. This waiver form releases the SFPD and the City & Co. of San Francisco from liability if you were to become injured or ill as a result of your work on behalf of the ALERT program. This "fillable" form can be completed and returned to Mark Hernandez, electronically, or you can print out the form and bring it with you to the event for which you have volunteered. There, it should be given to the ALERT volunteer assigned to collect these forms at the start of your assignment. NOTE: During declared emergency deployments ALERT members are covered by California’s Disaster Service Worker Volunteer Program. Have more questions? Please visit our ALERT FAQ page for further information. View the San Francisco Fire Department N.E.R.T. Training dates and locations. For more information on the San Francisco Police Department ALERT Program, email us at [email protected]; or call Sgt. Mark Hernandez (SFPD, Ret. ), SFPD ALERT Program Coordinator, at (415) 558-5545.